“Lovely Painting! Great Value! At MPG they're PROS, HONEST & AIM-TO-PLEASE! A+++"
was sold to a mystery bidder during a frantic three-way bidding war. 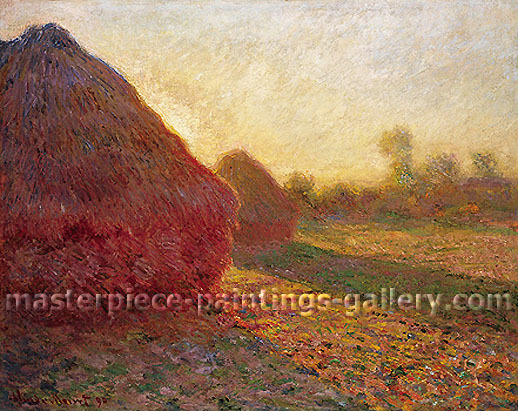 It is the highest priced painting of Monet's 23-piece Haystacks aka Grain Stacks series and sold for almost double Sotheby's pre-sale estimate. It had never left France before its owners sent it to England for sale at the auction. Painted, dated and signed by Monet in 1890, the full original size of this oil on canvas is 28.7 x 36.2 in. / 73 x 92 cm. That year he also bought the house and grounds in Giverny where he had been living for seven years. He devoted himself to developing his garden there and started two new series of paintings — poppy fields and poplar trees on the banks of the Epte. Another famous painting he did in 1890 that was not part of these three series was Boating on the Epte. French painter Claude Oscar Monet (1840-1926) was born in Paris and grew up in Le Havre. He shocked his contemporaries and revolutionized the way art was produced in the 19th century by painting en plein air — outside the studio — the only way he could capture the nuances of shimmering light and opalescent color that only nature could provide. And it was Monet that founded the “impressionist" movement which got its name from his painting Impression: The Rising Sun at the first exhibition of impressionist paintings he organized in 1874.
landscape painting. In 1883 he settled at Giverny near Paris where he created the extensive water gardens and lily ponds which became the predominant theme in his work. It was there that he painted the series of large-scale paintings of water lilies for which he is so famous. Above is a photo of Claude Monet in 1923-24 on the Rose Path leading to the house in his garden at Giverny. Monet experienced both poverty and prosperity. Despite failing eyesight, he continued to paint almost until his death on 5 December 1926. During the Franco-Prussian War, Monet fled to London for two years to avoid conscription into the military. While in London he spent a lot of time with Pissarro which affected his painting style, changing his choice of colors and continually decreasing the size of his brushstrokes. Monet was sometimes given to bouts of depression and pessimism during and after the Franco-Prussian War, which killed Camille (godfather of Monet's son Jean) and seriously injured Renoir. He took the death of his good friend Camille very badly. But they were prosperous days if not happy ones and enabled him to afford rent large rented homes in Argenteuil with great scenery which were the subject of many of his paintings. Monet lived there with his family for nearly eight years and it was there that he gained his place in history. His paintings done at Argenteuil became greatly polished and produced a stunning variety of work. He discovered his great talent for landscapes although it was discouraged by critics at the time. Monet believed nature was a sanctuary from the sadder side of life — particularly commercial development — and he made sure every home he had after the war had a luxurious garden — or he made one. If you have any questions, we'd be pleased to answer them. We have an “Immediate Response Policy” and try to respond to email inquiries as soon as we receive them or at least within 24 hours. We will deliver this painting anywhere in the world using UPS or DHL Worldwide Express 3-day, door-to-door courier service. This allows you to track movement of your art online by going to on the UPS or DHL web site. Input your tracking number and you'll get a detailed status report. We send you the tracking number by email after the courier picks up the artwork. The canvas for each of our paintings is stretched on a frame during the painting stage. When the painting is sufficiently dry, it is removed from the frame and the face covered with Gateway Translucent Natural Tracing Paper for protection. It is then rolled and inserted in an extremely sturdy 2 or 2.5 inch diameter PVC cylinder which is sealed, packaged, and delivered to your door by the courier. We accept all forms of payment, including cash, checks, money orders, money transfer (T/T), and credit cards via PayPal. PayPal is available to people in 38 countries. Paintings are shipped when personal checks have cleared and electronic transfers have arrived in our account. PayPal takes 3-4 work days to transfer your payment to our account. Take a Look at Today's Special Deals! We are currently offering a number of special deals on our completely hand painted masterpiece oil painting reproductions. You can see a complete list by clicking this hyperlink.